Preheat oven to 365. Make rice as directed. Line a cookie sheet with parchment paper. Spray both sides of each piece of Tilapia with olive oil spray. Place on cookie sheet. Season with salt and pepper. Bake in oven for 20 minutes or until fish is white and flaky. Meanwhile, mix all ingredients for mango salsa in one bowl, and chill until ready to serve. Heat oil in deep fryer or saucepan. While oil is heating, make wontons. Dab 1/2 tsp or so of cream cheese in center of wonton skin square. With your finger, run a strip of water along two edges of skin; fold skin in half, forming a triangle. Be sure to press air pockets out of filling prior to sealing completely. When oil is ready, fry each wonton until golden brown. Serve with sweet and sour sauce. 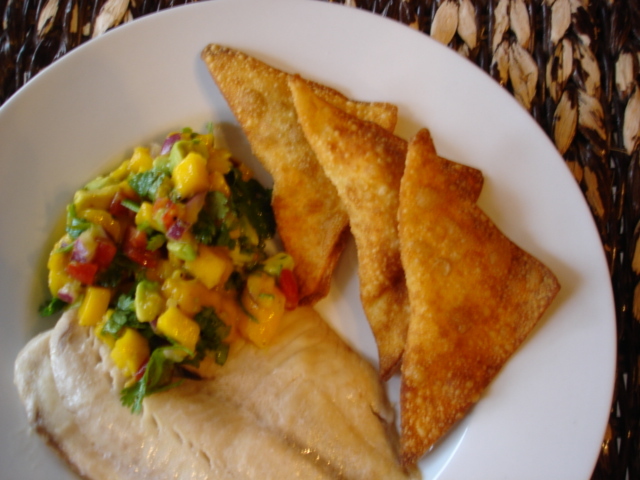 Assemble spoonful of chilled mango salsa over baked fish. Serve with rice and a few wontons. Instant vacation to Puerto Vallerta...enjoy.